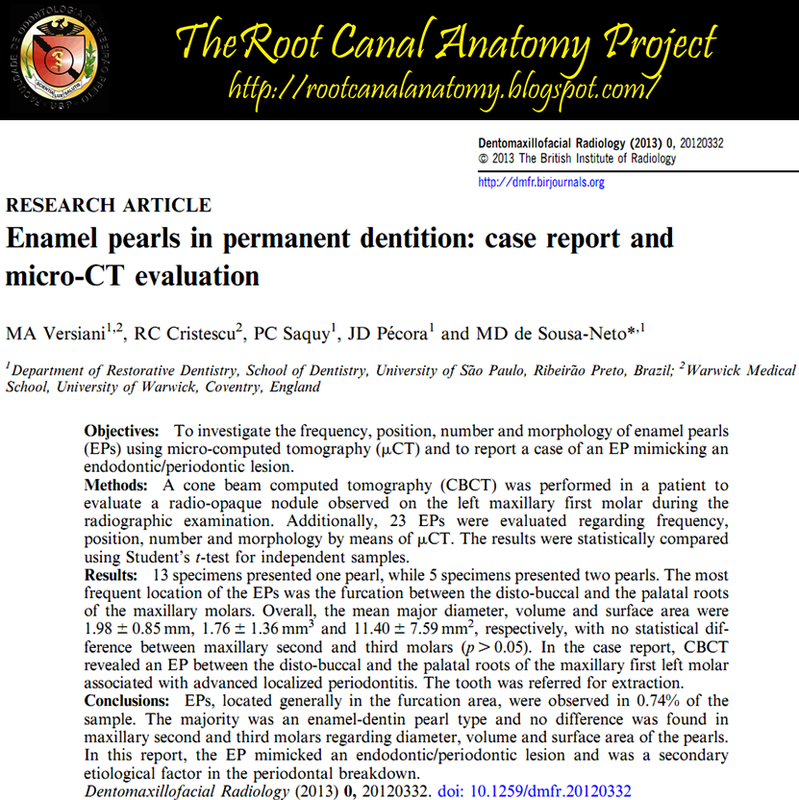 The article entitled "Enamel pearls in permanent dentition: case report and micro-CT evaluation" was published on the Dentomaxillofacial Radiology journal. By now, I am going to provide you with some important information about this morphological variation of teeth. 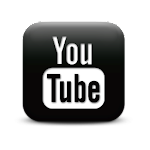 The following text was extracted from: Moskow BS, Canut PM. Studies on root enamel (2). Enamel pearls. A review of their morphology, localization, nomenclature, occurrence, classification, histogenesis and incidence. J Clin Periodontol 1990; 17: 275–281. When examined grossly or macroscopically, enamel pearls most commonly appear spheroid, however other shapes such as conical, ovoid, tear-drop, cylindrical and irregular have been observed (Negra & Olliveira 1974). They vary in size from a pine-head or smaller to that of a large cusp of a tooth. In one study of over 7000 teeth, the mean diameter of these enamel structures was found to be 1.7 mm (Sutalo et al. 1986). Risnes (1974) in a study of 8854 human molars, found a distribution in size of macroscopically detectable enamel pearls on roots from 0.3 mm to 4 mm. The greater proportion of these bodies varied in size from 0.5 mm to 1.5 mm in diameter. Loh (1986), in his study of 5674 teeth, found that 57% of the pearls ranged in diameter from 1.00 mm to 1.9 mm. The larger enamel pearls often resemble a cusp or even a small tooth. They appear as discrete, glass-like globular bodies attached to the root by a sessile base. They are easily differentiated from the cemental surface by their color and texture. It is most common to find 1 enamel pearl per root, however 2 such structures located on opposite sides of the root can sometimes be found. According to Cavanha (1965), the finding of 3 enamel pearls is rare, and the presence of 4 pearls is exceptional. Enamel pearls can be connected to cervical enamel extensions by a ridge of enamel. Enamel pearls have a distinct predilection for the furcation area of molar teeth and for concavities or furrows within the root structure. However, they have been found less commonly on the cervical and apical portions of the root (Cavanha 1965). They are most frequently encountered on the mesial or distal surfaces of maxillary 2nd and third molars, less frequently on the buccal or lingual surfaces of mandibular molars and rarely on the roots of incisors or bicuspids teeth (Bernaba & Wa- tanabe 1973, Risnes 1974, Oliveira et al. 1977, Loh 1980). When occurring on the roots of maxillary molars, they are most commonly seen between the disto- buccal and palatal roots, while they occur on the buccal in between the mesial and distal roots of lower molars (Risnes 1974). Intradental, also called internal or intradentinal enamel pearls, are found within the dentin and can have a coronal, cervical or radicular location. They are considered to be rare, but the fact they can only be identified radiographically limits the possibility of their recognition (Cavanha 1965, Kaugers 1983). 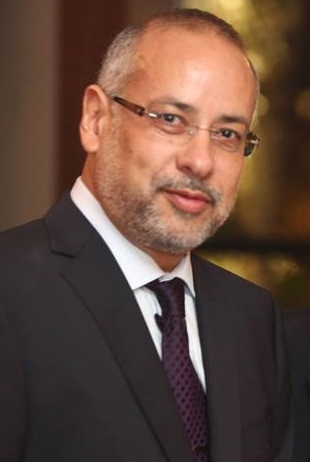 They have been also referred to as enamel droplets (Linderer & Linderer 1842), enamel nodules (Salter 1875), enamel globules, enamel knots, enamel exostoses (Virchow 1886) and enamelomas (Shafer et al. 1958, Thoma & Goldman 1960). The latter term refers to its earlier delineation as an odontogenic tumor which has been shown to be inaccurate. All of the above are considered to be extradental and can be viewed with the naked eye, macroscopically, or microscopically. While enamel pearls have been reported widely as occurring in human permanent molar teeth, their presence on deciduous teeth have also been observed. In a microradiographic study of 40 human deciduous molar teeth, an unexpected high-frequency of 33% was found at the intcrradicular line (Arys & Dourov 1987). Enamel pearls on deciduous teeth have been reported as rare in other studies (Bernaba & Watanabe 1973). These so-called anomalies have been further described in dogs (Schneck 1973), primates (Bernick & Levy 1968), rodents (Kalnins 1952), Tibetan wild sheep (Hooijer & Eulderink 1975) and Rhinoceros (Patte 1934, Hooijer 1946). An example of an "enameloma" in a prehistoric indian skull has even been reported by Koritzer (1970). Root excrescences which consiste solely of enamel are usually quite small (approximately 0.3 mm in diameter) and are called true enamel pearls or simple enamel pearls (Euler & Meyer 1927, Gollner 1928, Cavanha 1965). They lie directly over a smooth surface of dentin. Making up the largest category, are pearls which contain a core of tubular dentin within them. These have traditionally been termed composite enamel pearls (Bohm 1938), but more recently have been classified as enamel-dentin pearls (Cavanha 1965). The thickness of the dentin core varies according to the size of the pearl. Some larger composite enamel pearls may also contain pulpal tissue and these have been called enamel-dentin-pulp pearls (Cavanha 1965). As mentioned earlier, intradental pearls are contained within the dentinal structure and can assume a coronal, cervical or radicular location (Kaugers 1983). Extra dental enamel pearls are most commonly thought to represent the localized activity of portions of Hertwig's epithelial root sheath which have remained adherent to the dental surface after root development (Pfluger 1931, Bohm 1938, Fujita & Nakayama 1941, Pindborg 1970). These cells then may differentiate into functioning ameloblasts and produce enamel deposits on the root. 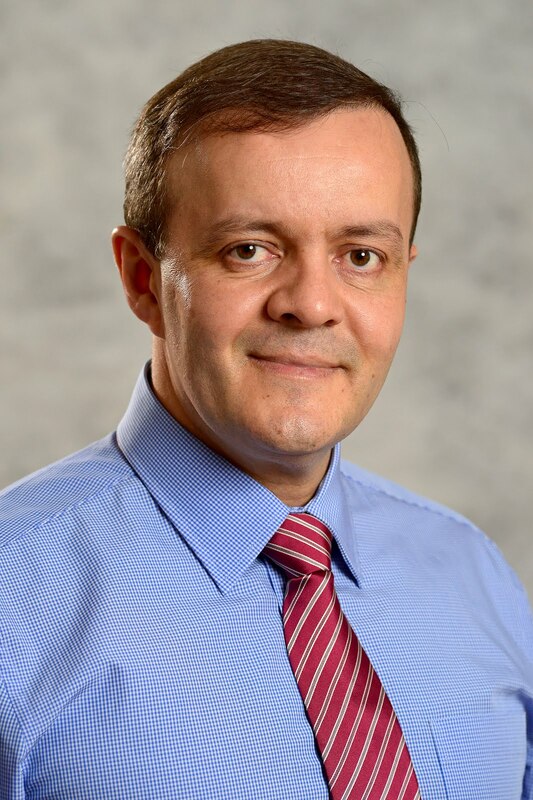 The prevalence of macroscopically discernable enamel pearls on human teeth has been evaluated in a number of large investigations (Turner 1945, Cavanha 1965, Bernaba & Watanabe 1973 Risnes 1974, Negra & Oliveira 1974, Loh 1980, Gaspersic 1985a, Sutalo et al. 1986). Most of these studies are in relative accordance with each other with the exception of the study of an Eskimo population (Pederson 1949). This investigation presented a significantly higher prevalence of enamel pearls than in other racial and national groups studied. All incidence studies have been based on the examination of skulls and extracted teeth. Where extracted teeth were employed, there usually existed some uncertainty about tooth determination, particularly in the separation of maxillary 2nd and 3rd molars. In the evaluation of the above studies, the overall occurrence of enamel pearls among all molars teeth was between l.l%-5.7%. The mean occurrence of enamel pearls in 9 large studies of enamel pearls in humans was 2.69%. The incidence of enamel pearls on molars in the Eskimo population was 9.7%. In all of the above investigations, far and away the highest incidence of enamel pearls was found on the roots of maxillary third molar teeth. Approximately 75% of all enamel pearls seen on molars occur on maxillary third molars. The mandibular third molar and the maxillary second molar are the 2nd most common sites for enamel pearl location. They are seen less frequently on maxillary first molars and mandibular 2nd molar roots (Risnes 1974, Loh 1980). Pearls are rarely seen on mandibular first molars, but have been reported in unusual instances on the roots of maxillary premolar and incisor teeth (Bernaba & Watanabe 1973, Oliveira, Leite & Neves 1977). In approximately 8.7% of the cases in which enamel pearls occur on molar roots, they occur in multiples, almost always 2 pearls on a tooth. However, cases in which 3 or even 4 enamel pearls are present have been described (Cavanha 1965, Loh 1980). It is interesting to note that GoUner (1928), in an histological study, reported an incidence of enamel pearls in the bifurcation of almost 50% in the molar teeth examined. In a more recent microscopic investigation of 40 lower molar teeth of young individuals, enamel pearls were found in 37 teeth. In 11 of these teeth, the pearls occurred singularly, but 26 had 2 or more pearls (Pedler 1959). The inconsistency between these 2 studies and the others reported herein is unsettling. It does, however, suggest that enamel pearls become considerably more common when specimens are examined histologically, rather than grossly or macroscopically (Moskow 1971, Suzuki 1958). 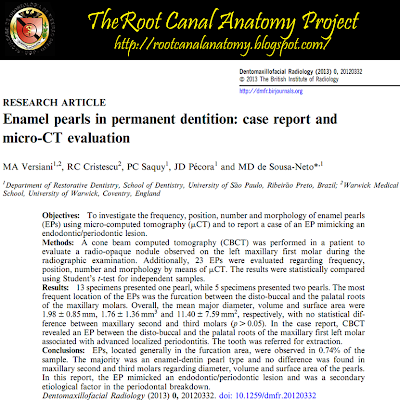 It would appear that the presence of enamel on the root in the form of pearls appears to have the same clinical implications in regard to the possible predisposition to certain types of osseous defects within the periodontal tissues as to what has been described with cervical enamel projections. While enamel pearls apparently have a distinct predilection for maxillary third and second molars, a distribution pattern which is different than that of enamel projections, they do occur most commonly in interradicular areas, and as such, could conceivably be associated with periodontal lesions in the furcation areas (Croft 1971, Vincent 1979, Goldstein 1979, Shiloah & Kopczyk 1979). Enamel pearls and cervical enamel projections can occur on the same teeth, and when they do, can be contiguous with each other. would like to take the chance to congratulate for an outstanding piece of research! This is highly appreciated.